Pre-Order Mike Yon's New Book - "Moment of Truth In Iraq"
Can We Risk Allowing Airbus to Build our Air Fleets? 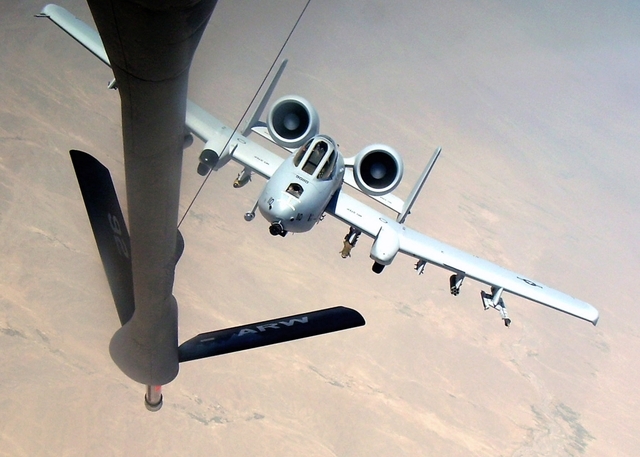 An A-10 Thunderbolt II from the 442nd Fighter Wing moves into position behind a KC-135 (tanker) on a combat mission over Afghanistan. A-10s from the 442nd are deployed to Bagram Airfield in support of Operation Enduring Freedom. The 442nd FW is an Air Force Reserve unit based at Whiteman Air Force Base, Mo. (US Air Force photo/Lt. Col. Marcel Dionne). Date Taken: January 15th, 2008. Location: Afghanistan, AF. This is probably the most ridiculous DOD contracting misstep that I've heard of in a long time. But, as I'm a former Soldier and not a USAF or DOD contract officer, I'd like your opinion - so read on and then please Comment if you are so inclined. In the coming weeks, the US Air Force tanker fleet will be focus of some serious decision making. Up for grabs is a $40 billion contract to replace our existing and aging fleet. One serious contender is European aircraft manufacturer Airbus - a company supported by European governments via the European Aeronautic, Defense and Space (EADS) consortium. And those governments don't play nice when it comes to getting contracts for Airbus. According to this Center for Security Policy Report, French Intelligence has supplied Airbus with information to help it break into the American market. France owns a 15% interest in Airbus. So, do we put our Air Force tanker fleet (and other fleets) at risk by considering a contract with Airbus? If you read the whole CSP report from almost a year ago, and do your own research (Lexis-Nexus will get you there), I don't see any possibility of awarding a contract to Airbus for our tanker fleet without putting our assets at an unreasonable risk. The CSP report gives plenty of nightmare scenarios that may or may not occur but also provides plenty of incriminating evidence that this looming deal is a very bad idea for our national security. ...When Airbus started work on the A400M almost a decade ago, it promised to apply its expertise in handling the cost-obsessed customers and brutal competition of commercial aviation to the world of defense procurement. Instead, Airbus stumbled on problems that have long dogged military contractors: politics, technology and weak project management. One of the first problems the project hit wasn't technical, but political. In April 2003, Airbus then-Chief Executive Noël Forgeard selected a turbine-powered propeller engine from Pratt & Whitney, a unit of U.S. industrial titan United Technologies Corp. Mr. Forgeard said Pratt's bid was 20% below a competing bid from Europrop International GmbH, a consortium of Britain's Rolls-Royce PLC, France's Safran SA, Germany's MTU Aero Engines and Spain's Industria de Turbo Propulsores. Pratt's plan was to modify an existing engine, while Europrop proposed developing a bigger one from scratch. The largest and most complex turboprop engine ever built, it would be able to lift more than Pratt's engine but would be tougher to develop. Several European governments, including France's and Germany's, said they would buy A400Ms only if equipped with Europrop engines. So Airbus extended its decision deadline, Europrop cut its price, and Mr. Forgeard announced a "satisfactory outcome." In mid-2006, when Airbus admitted it had crippling problems building the massive A380 jetliner, EADS investigated whether similar problems lurked in the A400M project. They did. The plane's sophisticated new body and wings are coming together well, Airbus says, but equipment attached to the airframe presented big headaches. Installing complex military electronics and defensive systems used to protect the largely unarmed A400M from attacks has been difficult. EADS chief Mr. Gallois, himself a veteran of the engine business, says because Europe hadn't developed an entirely new turboprop in decades, engineers had to relearn the technology. You can read the whole article here if you have a subscription. It's definitely an interesting read and brings us back to the point of whether we can strategically afford to have Airbus and EADS supply our Air Force with critical components such as transports and tanker aircraft? Sound Off in the Comments. I'm interested in your opinions (especially you readers in that line of work).